Earthy, hearty and seriously comforting, this Wild Rice & Mushroom Soup is just the ticket for our rainy fall days. The local forecasters are playing chicken-little lately, all in a frenzy with hurricane Joaquin heading our way. We may, or we may not, get over 4 inches of rain this weekend. So glad we got a new roof last winter! But enough with the prognostication, let’s talk about wild rice and mushrooms! Thick, rich, nutty and delicious, this soup is super filling with a distinct mushroom flavor. Made with wine, vegetable broth and leeks then finished with a little cream, the soup cooks quickly and is on the table before the big rain comes! I served ours with whole grain seeded bread and a dollop of parsley butter on top. I found the wild rice blend in the bulk bins at our local grocery store, and the dried porcini mushrooms in the Italian section. Thick, rich, hearty, earthy and comforting - this soup is uniquely different and perfect for the mushroom lover in your house. Put the salt, thyme, whole garlic clove and 6 cups cold water in a medium heavy bottom saucepan. Bring to a boil and add the wild rice. Lower the heat but maintain a steady boil. Cover and cook until the rice is tender, about 40-45 minutes. Remove the thyme stems and garlic clove and discard. Drain the rice and set aside. Place the porcini in a 2-cup measure. Pour 1 1/2 cups boiling water over the mushrooms and set aside until soft, about 15 minutes. In a large soup pot, melt 1 tablespoon butter with the olive oil over medium-high heat. Add the Crimini mushrooms, minced garlic, sliced leek and tomato paste to the butter, olive oil mixture. Cook stirring occasionally until the mushrooms release their liquid, about 10 minutes. Remove the porcini from the water using a slotted spoon (reserve liquid). Chop the porcini and add to the pot with the leeks and mushrooms. Sprinkle the flour over the cooking vegetables and cook, stirring constantly, until the flour starts to stick to the bottom of the pot. Add the wine, vegetable broth and the reserved liquid from the porcini (pouring slowly so as to leave any grit behind.) Bring to a boil, then lower heat to a steady simmer, and cook for 15 minutes. Combine the remaining 4 tablespoons butter, fine sea salt, ground black pepper and parsley in a small bowl. Set aside. Add the cooked wild rice to the vegetables and broth and cook for 10 minutes. Add the cream and soy sauce and cook until heated through. Serve with a dollop of parsley butter on each bowl. Pin on your favorite Soup Board! A good dutch oven is indispensable in the kitchen, especially when cooking soups! My husband and I were talking about hurricane food. If you were going to be stuck inside for the weekend due to bad weather and excessive rain, what would you make? I was thinking about a hearty stew, or shrimp and grits. Or maybe homemade rolls and a good potato leek soup. Yummy! Hope you have some sunshine and a wonderful weekend! Thanks so much for stopping by. This soup sounds amazing! But I am the only one in the household that would eat it. Do you think this soup could be canned? I just made this for dinner. The only complaint my family had, was that there weren’t enough leftovers for everyone to eat for the rest of the week. I did make a few minor changes. I only added 1/2 cup of white wine (the wine I had was not really the best), unsweetened plain almond milk instead of heavy cream and I omitted the parsley butter. This was so good and hit the spot on a cold, rainy New England night. the soup is wonderful and the recipe easy to follow. thank you!!! Thank you Jutta – we love it too 🙂 I appreciate you trying our recipe and for the feedback. Have a wonderful holiday season. 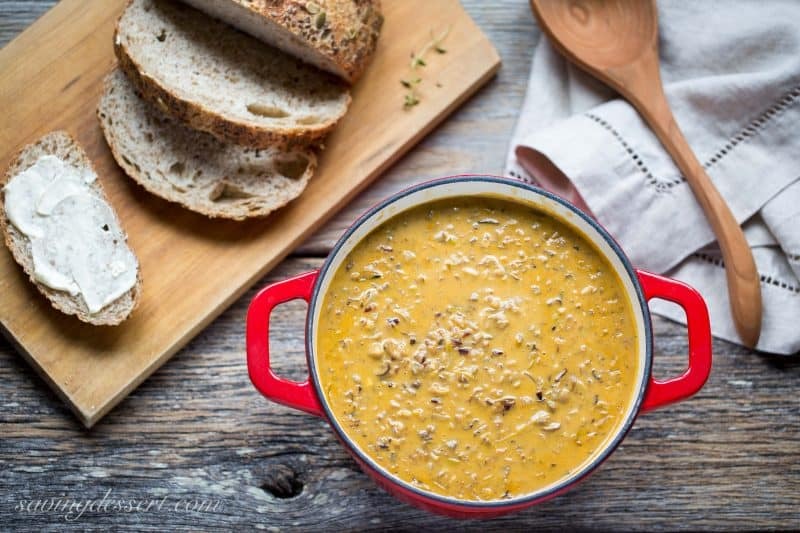 Do you have the nutritional facts for this yummy looking soup? No I don’t Barbara – sorry! I just made this soup and I did somethings different. While I was not trying to be a rebel, I didn’t use wild rice; I didn’t take the time to soak any and I was starving so I used shell pasta instead for the starch/carb. Also, I didn’t have porcini mushrooms, instead I used the frozen mixed mushrooms from Whole Foods plus some additional shiitake mushrooms. It tastes great. Also, I didn’t add additional salt. I read some other comments about how salty it might taste so I excluded it and let the sodium from the broth and soy sauce serve that purpose. Again, it tastes great and I will make this again. I love a great soup. This is one of my favourite recipes! I’ve made it several times now and it is AMAZING! That’s wonderful Sarah – thank you so much for the feedback. We love this earthy recipe and could eat it weekly! Thanks again for trying our recipe and for letting us know! This look delicious! Do you think I would be able to replace the heavy cream with coconut milk? Hi Dominique – I think that might work but I haven’t tried it so I can’t say for sure. Let me know if you do and if it turns out great! Thanks for trying our recipes! So delicious! I substituted shitake for the porcini mushrooms and used milk instead of cream just because that’s what i had on hand. Will definitely make this again! I have made this multiple times for friends, and everyone always raves about it. Question: Do you think adding roasted hazelnuts to this would be good? Hi Jason – thanks for the feedback! I love nuts in everything, so adding hazelnuts to a soup might be just the thing to set it apart. Love your idea! Yeah! Thanks so much for the feedback. We agree completely – it is so earthy and hearty. Perfect for these cold fall nights. I love your addition of chicken and chicken broth – I bet that really adds so rich flavor to this soup – going to have to try that! Thanks again. None better. This soup is an absolute delightful dish. Made this today and it is beyond amazing!! I used mushroom broth and since I’m vegan, I subbed heavy cream for soy creamer. it is delicious!!! Thank you! Thank you Lauren! I love feedback and your changes sound perfect. Have a wonderful week! Hello Tricia, and thank you so much for this wonderful recipe! In North Italy, where I’m from, it’s already cold enough for me to grab the ingredients and make this beauty. One tiny question: is this recipe freezer-friendly as far as you know? Thank you so much! Hi Alice! I am so excited you are going to try this recipe. We LOVE it! I am sorry but have not tried freezing the soup. I wonder if the mushrooms will retain their texture so that would be my only concern. I would love to hear how it turns out for you and if you freeze it with success. I would love to visit Italy one day – I bet you have wonderful memories of home. Thanks so much and good luck! I’ve not had mushroom soup in a very long time, but I love it and need to try it again, your recipe looks great! Hope you’re safe from the floodwaters where you are! The hurricane missed us, thank goodness, but we still received several inches of rain. It was a good weekend to stay inside and get some things done. Hope you had a lovely weekend and thanks! You bet Betty! It has been a cold and dreary weekend and soup is always a favorite on days like these. Hope you are having a great year! Your soup looks really delicious, Tricia! 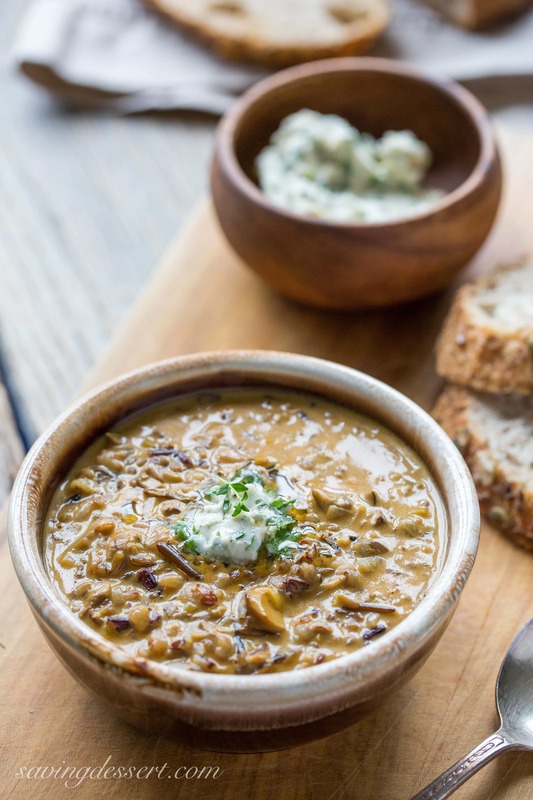 We love mushroom soup and this one would be perfect for the weather, or any time! Thanks for the good recipe! Thank you Pam – it is a keeper! Tricia what a fabulous soup! I reckon I would make oxtail as comfort food if were were stuck inside with horrid weather. I’ve never had oxtail soup but have always wondered about it. Hope you have a super weekend and thanks! This looks like a rich filling tasty soup for a rainy day. Absolutely perfect for a rainy day Gerlinde! Thanks so much for stopping by. Hope you have a very nice weekend. Oh my goodness, I want to make this ASAP! It looks so good and the list of ingredients sound wonderful. We went from a mild September to blustery and chilly the past few days. Definitely soup weather! I hope you don’t get all of that rain – yikes! That does look so earthy..fallish..and delicious.Take care..
Let me see..Osso Bucco on creamy mashed potatoes w/ a gremolata..fondue..spaguetti and meatballs.. I like your menu Monique – and I know it would be beautiful! Hi Tricia, your soup looks like heaven in a bowl, wild rice and mushrooms is one of my favorites. We just got back into Phoenix and it is 104 today, oh how I wish it was cool enough to prepare a bowl of this. Good-luck weathering the storm 4 inches seems like alot of moisture. Take care!!!! I bet the heat makes it feel like summer – glad you got home okay 🙂 Have a wonderful weekend. This soup just screams fall. I adore wild rice and mushrooms. I would want total comfort food in a hurricane. As long as I had electricity. Or a camping stove. Are you worried? That it does Abbe! Looks like the hurricane is taking a right and heading out to sea. We are however, getting plenty of rain, wind and cold. Feels like fall! Have a wonderful weekend. I desperately need this! So satisfying, delicious and healthy as well, Tricia. Thanks Angie – it is so good and satisfying. Hope you give it a try – have a lovely weekend! This soup would be a fabulous centerpiece for any meal. It’s so hearty and satisfying, I think that bread on the side is just the right accompaniment and all I’d need. I’m absolutely thinking soup right now…weather is dark and dreary but not too wet thus far. Hope you have a cozy warm weekend inside, enjoying some of this wonderful soup or something else equally delicious you’ve whipped up! looks delicious Tricia – should make great hurricane food. I like the close up shot. Fall and mushroom soup have a natural affinity as far as I’m concerned. I’ve been following your weather as my hometown of Roanoke, VA is in the path and being rather had hit. Hope all will be well for–well, all!! We are having some rain today Bonnie – and I am sure Roanoke is too. Looks like the hurricane took a right and spared us all a direct hi. Have a great weekend! 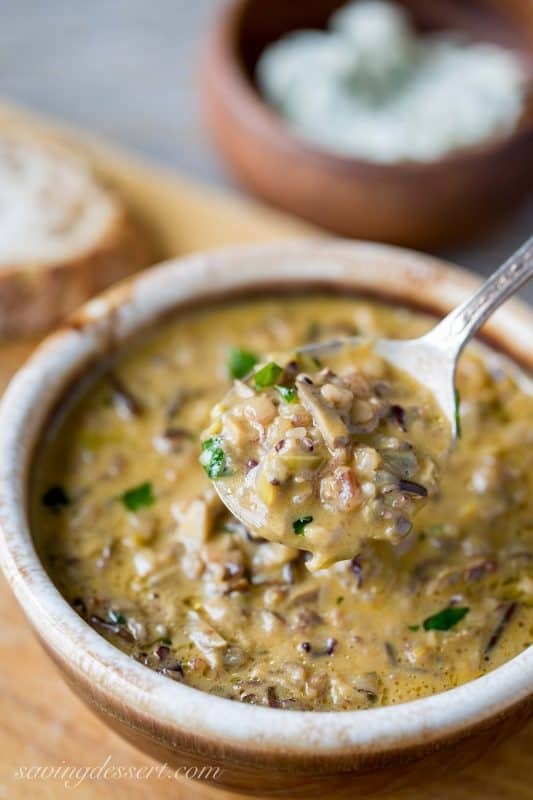 I have a packet of wild rice in the cupboard and I would love to try this soup — this feels like the perfect fall dish! Thanks Sue – it is a wonderful, rich delicious treat! Have a wonderful weekend. Oh my gosh Tricia, we’re having the same rain and I want this on my weekend menu. It looks amazing and sounds even better than amazing when I look at the recipe. This would be a big hit at my house! Looks like you are going to get a lot of rain this weekend! Thank goodness we all missed a direct hit from the hurricane. This is a wonderful soup – hope you give it a try! I made this recipe on the weekend and it didn’t turn out as expected. It lacks flavor and ended up not creamy as the photo indicates. I am so sorry you feel the recipe didn’t turn out as expected. I’m not sure why your experience was completely opposite to ours. I made it exactly as written and you can see the photo results. I do however, really appreciate your feedback and will test this recipe again at my earliest convenience. We LOVE it and enjoyed the earthy flavor from all the mushrooms and rice. Thanks for letting me know and I hope you will not let this experience taint your willingness to try other recipes we have shared. Hope you have a great week and thanks again for taking the time to provide feedback.